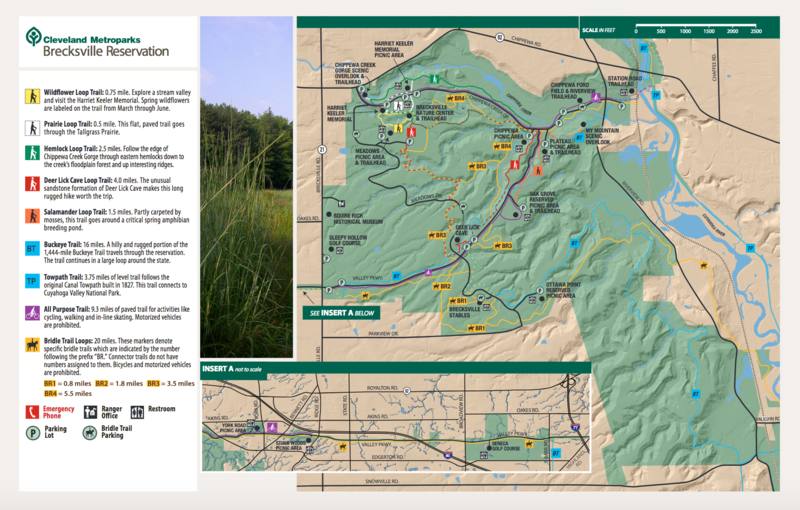 The Cleveland Metropark reservations are linked together to form the giant green (emerald) necklace around the outskirts of the city. 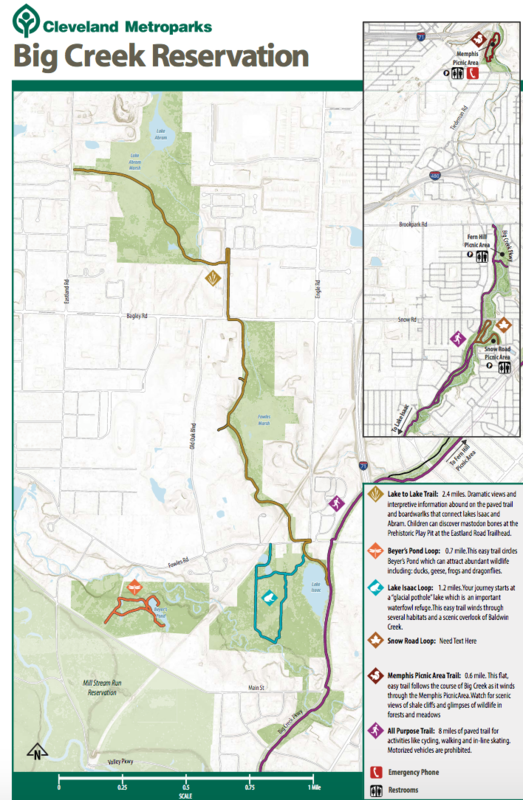 This Emerald Necklace has a paved “all-purpose trail” totaling about 70 miles and nearly 20,000 acres. The trail winds its way, frequently along rivers and creeks, taking you up and down small hills. This is basically a series of linear parks that run into one another — a series of “reservations”. Some sections might be narrow or rugged for running. A description of some of the more notable areas for running are below. Big Creek Reservation. Closest to downtown. 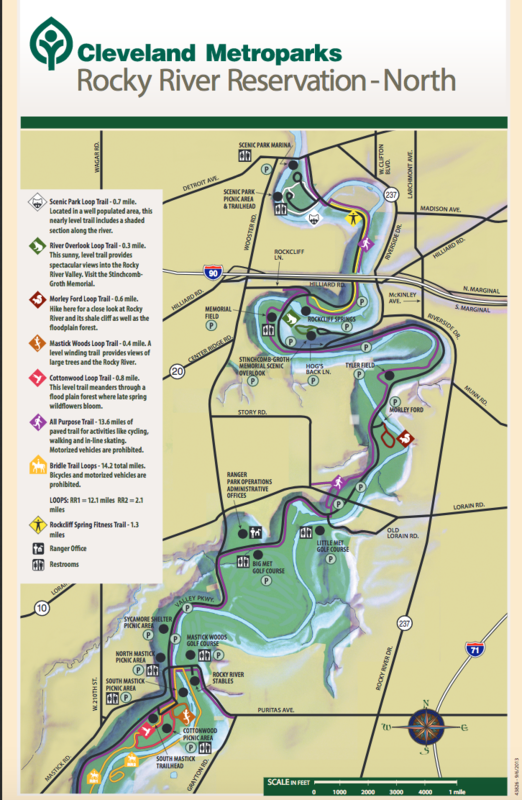 The highlight is the Lake to Lake Trail, a 2.4 mile all-purpose trail that connects Lake Abram to Lake Isaac. Start at traihead at Brookpark Rd. Rocky River Reservation: Northern Section/Southern Section. Located on the west side of Cleveland about 20 minutes away from downtown, Rocky River Reservation is a must see! 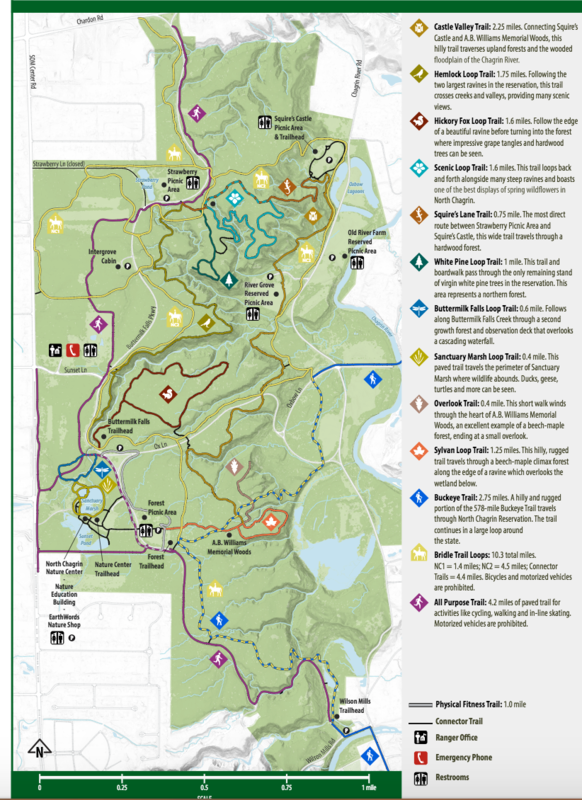 The all-purpose trail runs for 13.9 miles and is best for out and back runs. Traveling along Rocky River, you’ll see the massive shale cliffs, huge sycamore trees, numerous bird species and possibly white-tailed deer. Conveniently, this Reservation is located directly next to the International Airport. If you are stuck in an Airport Hotel, this run is accessible from your doorstep. North Chagrin Reservation. Located in Mayfield and Willoughby Hills, about a 25-minute drive west of downrown. Home to Squires Castle, the park includes a 4.2 mile, hilly multipurpose trail. Also includes a nature center, a many gravel and dirt trails, and playing fields. Brecksville Reservation. 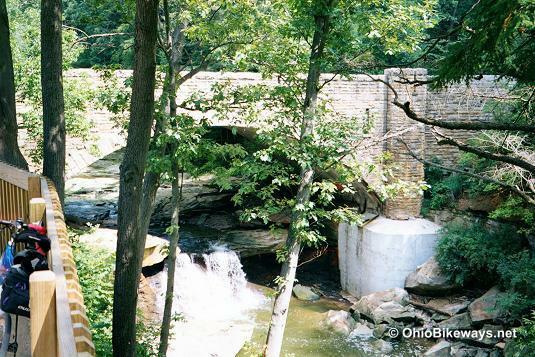 Also about 25 minutes south of Cleveland, the Brecksville Reservation borders Cuyahoga Valley National Park. The all-purpose trail extends 9.3 miles and passes Chippewa Creek Gorge scenic overlook and Dear Lick Cave. Note: this is hilly, with some hills up to a mile in length. The park also includes horse stables, the Sleepy Hollow Golf Course, a nature center, picnic areas, multiple additional trails. hello!,I really like your writing so a lot! percentage we keep in touch extra about your post on AOL? I need a specialist in this space to solve my problem. May be that is you! Taking a look ahead to peer you. This site is mostly a walk-by for the entire data you wanted about this and didn’t know who to ask. Glimpse here, and also you’ll positively discover it. You created some decent points there. I looked online for the concern and identified most people will go together with with your web-site. I enjoy you because of all of the work on this web page. Debby takes pleasure in doing research and it is simple to grasp why. We know all about the powerful manner you produce reliable tips and tricks via this website and as well encourage participation from visitors on this concern so our favorite daughter has always been discovering so much. Have fun with the rest of the new year. You are always conducting a very good job. I’m impressed, I have to say. Really not often do I encounter a weblog that’s both educative and entertaining, and let me inform you, you’ve hit the nail on the head. Your idea is outstanding; the difficulty is something that not sufficient people are talking intelligently about. I’m very completely satisfied that I stumbled throughout this in my search for something relating to this. Hi there, just become aware of your weblog through Google, and found that it’s really informative. I’m going to be careful for brussels. I’ll appreciate in case you continue this in future. A lot of other folks will likely be benefited out of your writing. Cheers! Good post. I find out one thing extra challenging on distinct blogs everyday. It will generally be stimulating to read content from other writers and practice somewhat one thing from their store. I’d prefer to utilize some with the content material on my blog no matter if you don’t thoughts. Natually I’ll offer you a link on your web blog. Hmm it appears like your site ate my first comment (it was extremely long) so I guess I’ll just sum it up what I wrote and say, I’m thoroughly enjoying your blog. I as well am an aspiring blog writer but I’m still new to the whole thing. Do you have any points for rookie blog writers? I’d genuinely appreciate it. Hey there! I’ve been reading your blog for a while now and finally got the courage to go ahead and give you a shout out from Kingwood Texas! Just wanted to tell you keep up the good job! Wow, this piece of writing is fastidious, my sister is analyzing such things, therefore I am going to inform her.